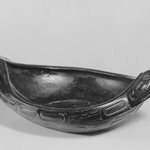 What is a potlatch ceremony? 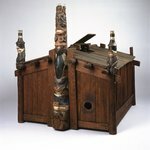 Potlatches were elaborate feasts, usually held in the winter that included ceremonies.They could range from minor events for children at various times in their life cycle, to more significant festivals celebrating the assumption of dance privileges to great, elaborate events including many activities: the assumption of chiefly name and position, the exchange of coppers (objects that looks like a shield made from copper with symbolic designs on it and is of great value and prestige), marriages, the erection of totem poles, and the buildings of houses. 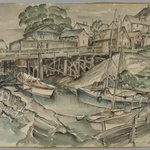 On each of these occasions, guests received payment from the host for their service as witnesses; their acceptance of these payments signified their validation of their host's claims of status, so they were also a way to re-distribute wealth within communities. 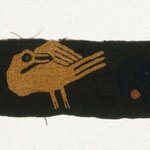 Payments included button blankets (trade blankets with trade buttons sewn on in clan designs), and towering stacks of Hudson Bay trade blankets. 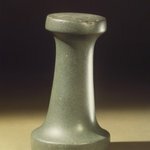 Button Blankets were regalia that was generally worn by women. 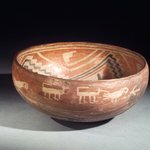 Other forms of payments included feast dishes carved from wood and horn, and coppers (pieces of valuable metal also sometimes carved), dance regalia, food, and elaborately carved rattles. Why did he take off his mask to be human? 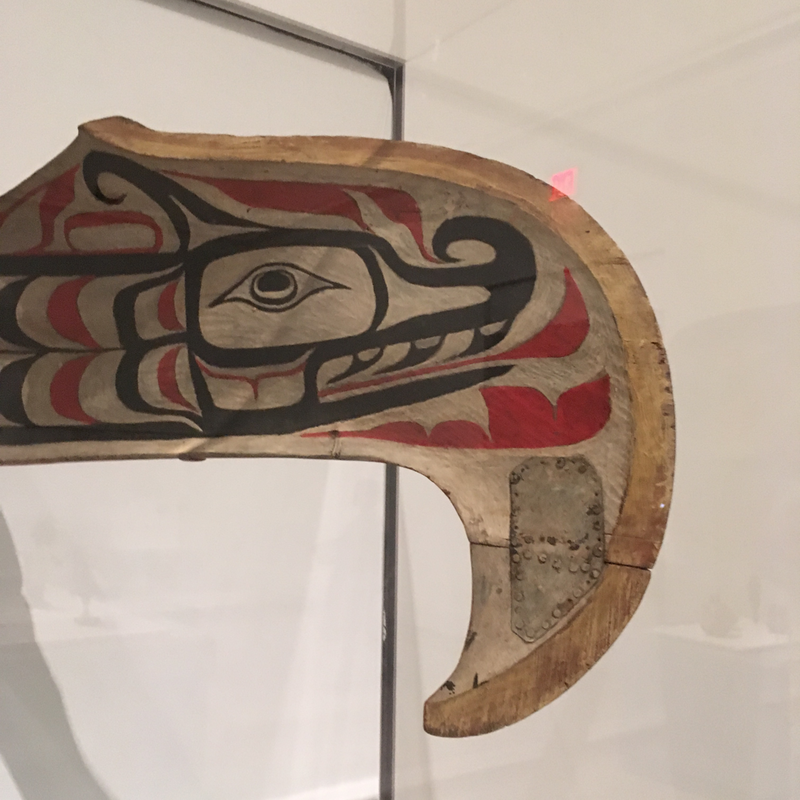 You may have read this in the label already, but in the story that this relates to, the Thunderbird flew out of the heavens to assist a man who had been transformed into a large halibut. 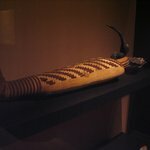 In order to do so, the Thunderbird removed his headdress and winged cape and became human (but he later changed back). So he was temporarily human to help someone. Do people still use these masks today? 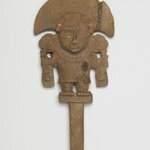 Yes, the masks like this are still used today in ceremonies. 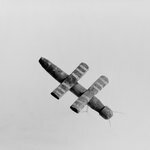 They are used in ceremonial dances called a potlach, generally taken place during the winter. Songs, dances and rituals are performed and gifts may be given at this time. When not used such masks are wrapped carefully and hidden away. 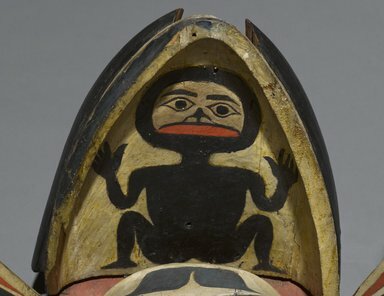 When worn and danced and closed the mask portrays a bird head with a large yellow beak. 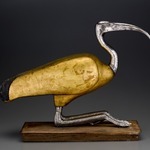 When open, the head and large beak divide, expand, and become a full-bodied bird with outstretched wings and a human face, thus portraying a transformation story. 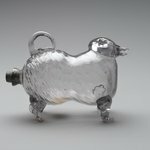 Do people still wear these? 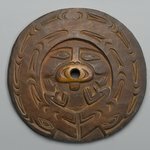 One of my favorite pieces and a great example of a Northwest Coast transformation mask in excellent condition. Did you notice the cords that were used as pulleys to open and close it (and make amazing thunder clapping noises). Yes, people do still use these today. 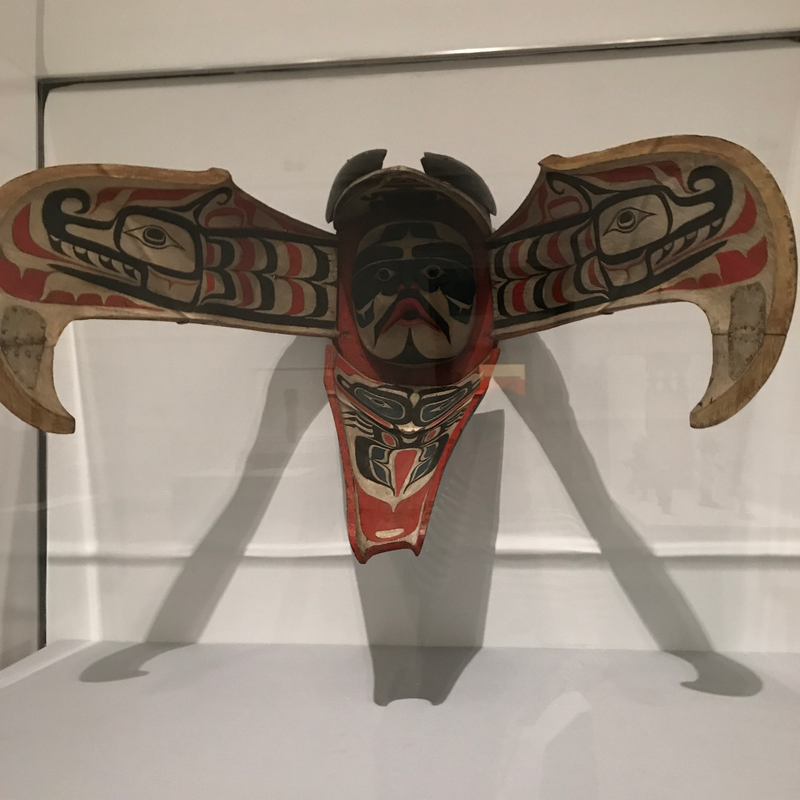 the Kwakwaka'wakw people still have an amazing sculptural tradition and still make transformation masks to be worn during potlatches. 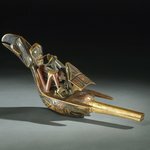 Potlatches were banned for quite some time in Canada and had to go underground, but they are once again being practiced/celebrated. 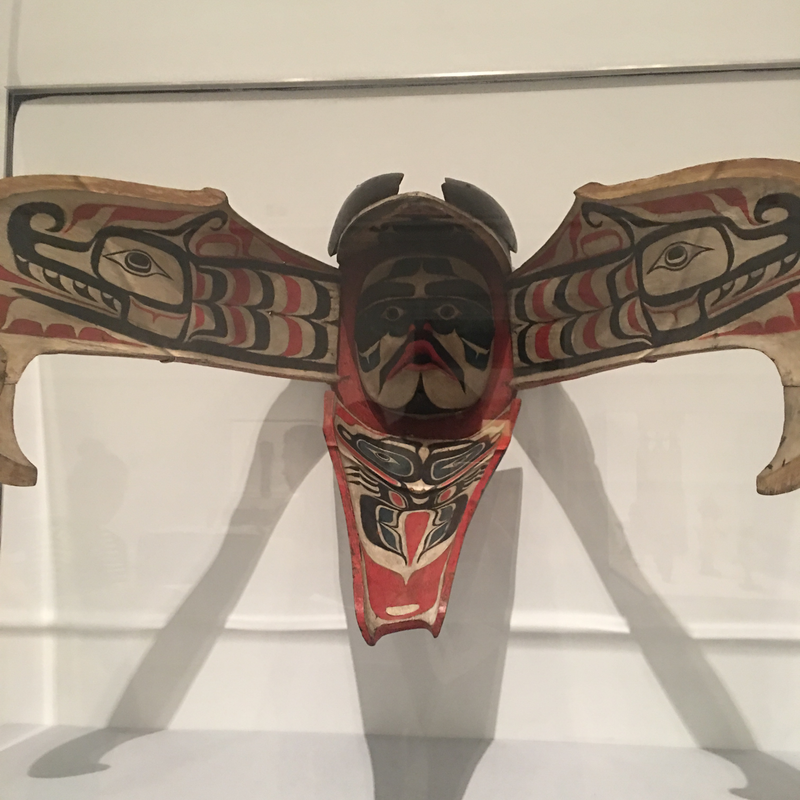 Yes, the family of Kwakwaka'wakw Chief William T. Cranmer of the ‘Namgis clan (Alert Bay, Canada) hold the rights to wear this type of mask. Initiated members of the clan may be given the rights to perform it during a Winter Dance or potlatch ceremony. 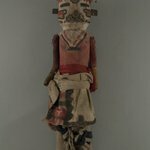 The performer wears the mask over his or her head while the rest of the body is covered by long strips of cedar bark. 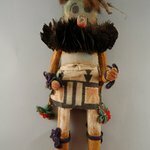 He or she dances around a ceremonial fire and at a dramatic moment opens and shuts the beak of the mask by manipulating cords, thus revealing a human form within. 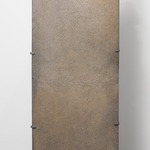 If you look on the sides, you can see the ropes and hinges that make it move during the dance. 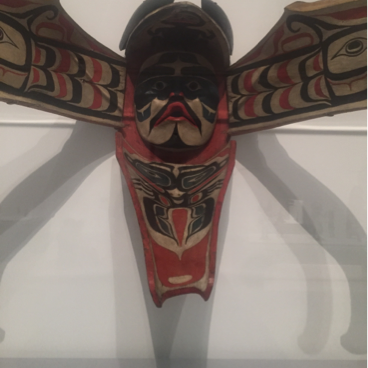 Only very specific people in the Kwakwaka'wakw community have the privilege and right to wear and perform the different masks. It would help reaffirm the family's ancestral ties with the thunderbird. 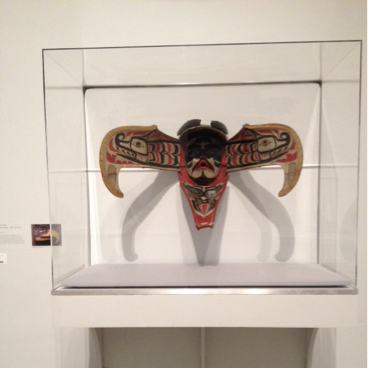 (There's another impressive Kwakwaka'wakw mask on the first floor in the Connecting Cultures gallery). Do people still wear these masks today? If you look closely under the top, you will see another human form painted in black. 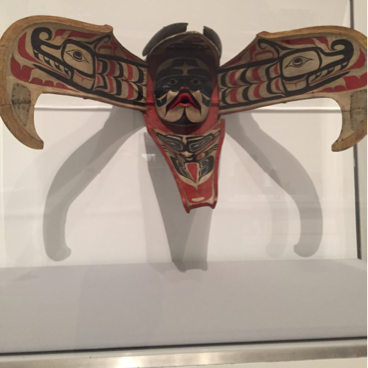 It is--the Kwakwaka'wakw community has been been very active with mask carving for many centuries! 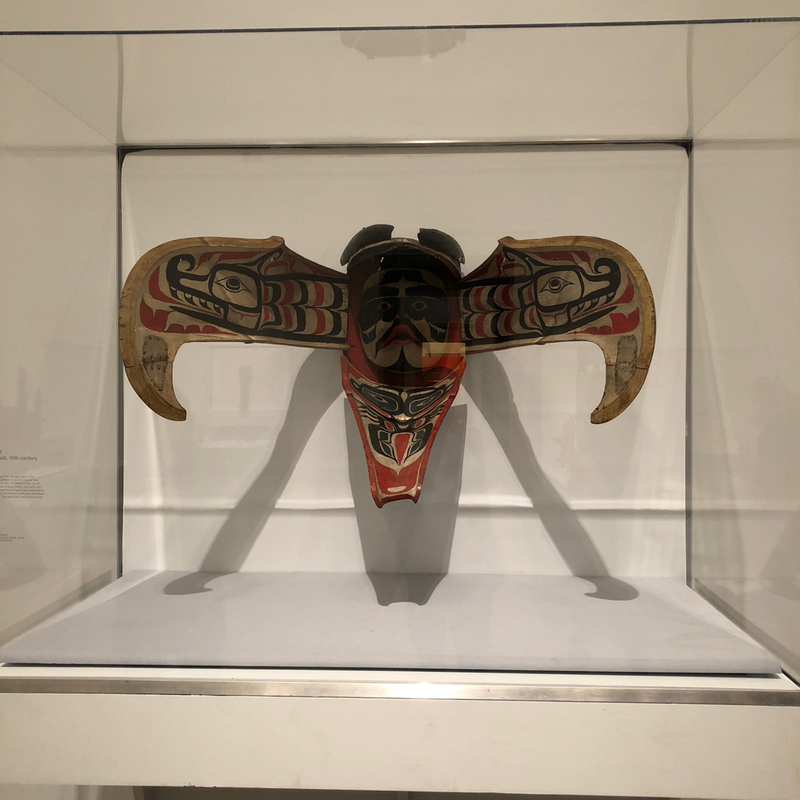 If you want to see another large Kwakwaka'wakw mask, there is a Baleen Whale mask on the 1st floor in the Connecting Cultures exhibition that is quite impressive also. 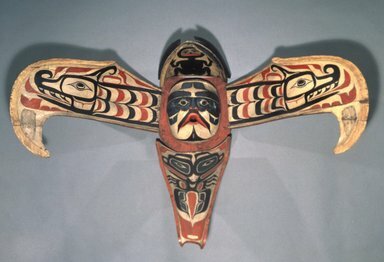 Is this the mask the Seahawks logo is inspired by? Good eye! 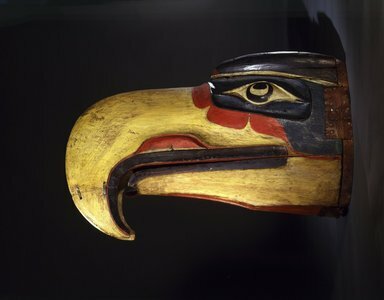 The Seahawks' logo was indeed inspired by the Thunderbird Masks of the Kwakwaka'wakw. 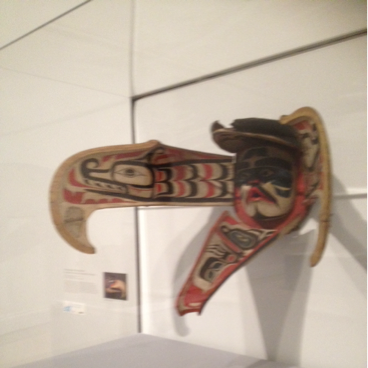 And the Seahawks respectfully checked with the Kwakwaka’wakw before using their imagery. 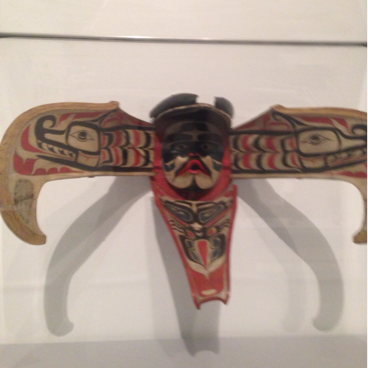 This is a Thunderbird Transformation Mask from the Kwakwaka'wakw people of British Columbia, Canada. 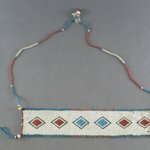 It would have been worn for dance performances during potlaches. 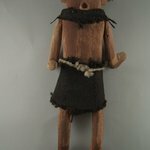 Potlatches are communal celebrations where a family or group gives gifts to the community. 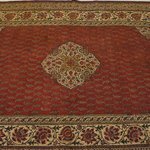 The gifts are often things like food and an opportunity to experience a particular dance the family 'owns.' This mask would be danced in Winter Ceremony potlatches . Is that riveted plate original to the thunderbird mask? Yes it is! 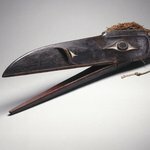 The performer of this mask will wear it over their head and manipulate the beak with cords, periodically revealing the human form within! 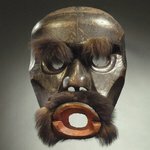 Which Northwest Coast group does this mask and the associated story belong to? Where do they live? 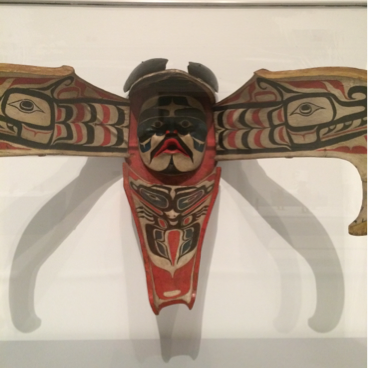 This thunderbird transformation mask comes from the Namgis clan of the Kwakwaka’wakw. They live in the northern part of Vancouver Island, and in parts of the nearby mainland. 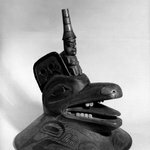 At the center of these two snakes is a human face, perhaps the thunderbird in its human guise. 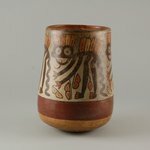 Above the head is a small seated figure, probably an ancestor or deceased chief and below is what has been described as both a bird and a split profile bear. Oh I see, what is the thunderbird's role in the potlatch? 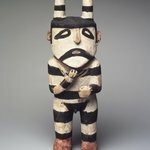 Among many indigenous communities, masks are considered to come alive when they are danced, enabling the wearers to become the actual spirits they are representing. 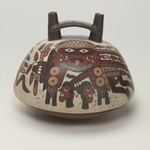 In this way masks connect the wearers to their ancestral past. 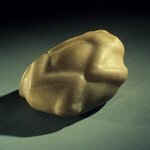 How did they wear this mask and why is made of such a heavy material? 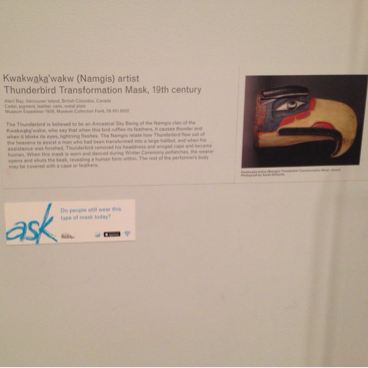 The Thunderbird is believed to be an "Ancestral Sky Being" of the Namgis clan of the Kwakwaka’wakw. 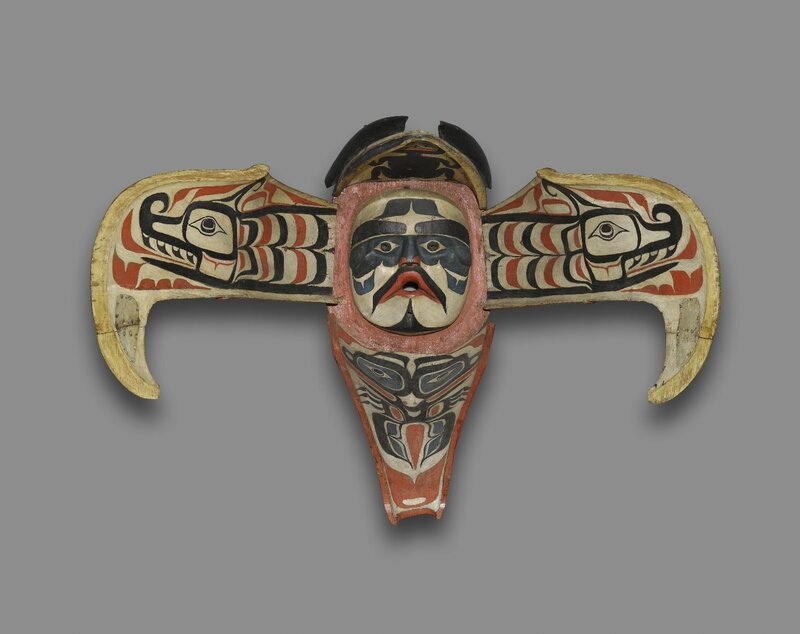 This mask is worn during dances at Winter Ceremony potlatches. 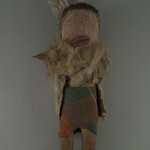 The performer wears the mask over his or her head and manipulates the various hinged pieces via strings, like a puppet! 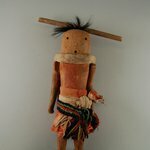 The performer wears the mask over his or her head while the rest of the body is covered by long strips of cedar bark. The rest of the body is covered with a cape or feathers. 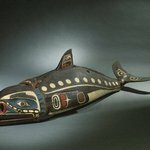 Wood is one of the traditional carving mediums of various Northwest Coast tribes. Although this mask would have some heft, it was not unbearably heavy. 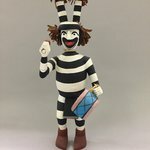 How does the mask open and close? Chords attached to the mask allow the wearer to open and shut the beak at appropriate moments during the performance. Why does this mask open and close? For certain Northwest Coast cultures, special masks referred to as "transformation masks" change the wearer into someone or something else. 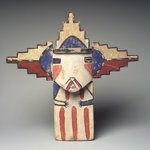 This mask relates to the mythical story of the Thunderbird who left the heavens and temporarily transformed into a human to help a man in need. While wearing the mask and dancing, the person reenacts that transformation, opening the beak to reveal the human figure within. could open it to reveal himself or herself. 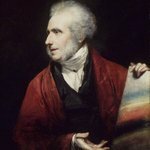 In that way, everyone could remember the close connections between all living things. 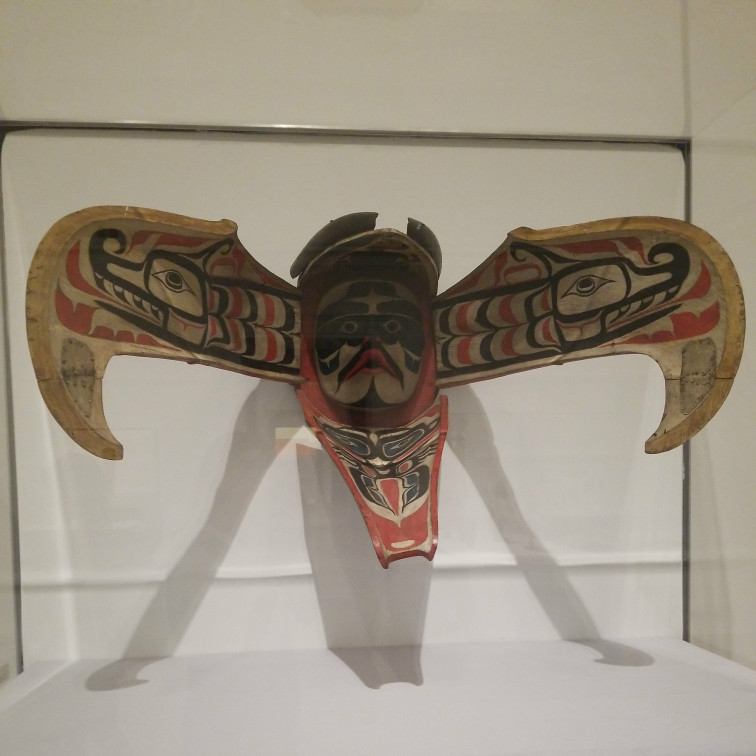 The Thunderbird is believed to be an Ancestral Sky Being of the Namgis clan of the Kwakwaka’wakw, who say that when this bird ruffles its feathers, it causes thunder and when it blinks its eyes, lightning flashes. 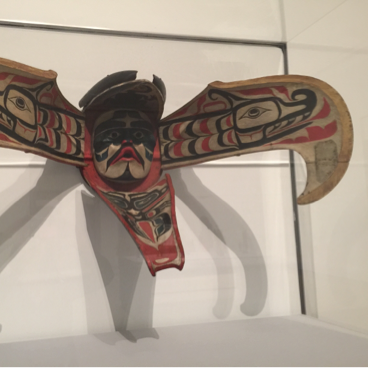 The Namgis relate how Thunderbird flew out of the heavens to assist a man who had been transformed into a large halibut, and when his assistance was finished, Thunderbird removed his headdress and winged cape and became human. When this mask is worn and danced during Winter Ceremony potlatches, the wearer opens and shuts the beak, revealing a human form within. The rest of the performer’s body may be covered with a cape or feathers. 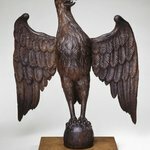 El Pájaro-Trueno se cree que es un Ser Celestial Ancestral del clan Namgis de los Kwakwaka’wakw, que dicen que cuando este pájaro se acicala las plumas, causa tormentas y cuando pestañea, el relámpago. 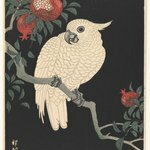 Los Namgis relatan cómo Pájaro- Trueno voló desde los cielos para ayudar a un hombre que había sido convertido en un gran pez y cuando hubo terminado, Pájaro-Trueno se quito su tocado y capa alada y se volvió humano. Cuando esta máscara se lleva en la danza durante potlaches de Ceremonias de Invierno, el usuario abre y cierra el pico, revelando la forma humana en su interior. 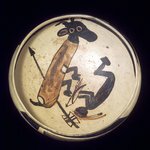 El resto del cuerpo del danzante puede estar cubierto por una capa o plumas. 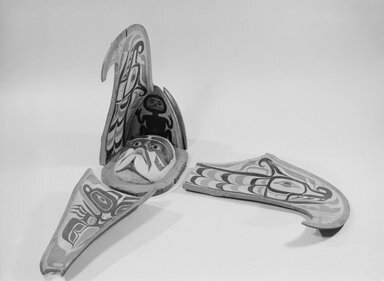 CATALOGUE DESCRIPTION Transformation masks such as this Thunderbird belong to the sky world, which consists of Ancestral Beings that are transported to the heavens from where they can return as material beings in recognizable form such as human. The Kwak waka’ wakw people say when this bird ruffles its feathers they cause thunder and when they blink their eyes lightning flashes. 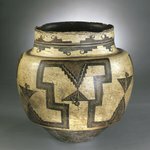 Each thunderbird is associated with a specific village group or lineage, a specific place of origin unique to each and its details are carefully guarded. Masks can be owned individually or by a family but rights are always inherent, flowing from one generation to the next. The Namgis people relate that this thunderbird flew out of the heavens to assist a man who had transformed into a large halibut. When finished assisting he removed his headdress and winged cape and sent them back to the sky world becoming human. 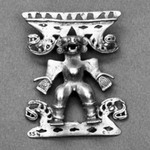 The mask may be worn on the forehead with the dancer’s face showing or it may cover the face to indicate the duality of man and bird. 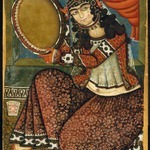 The performer wears a full costume of representing the bird. 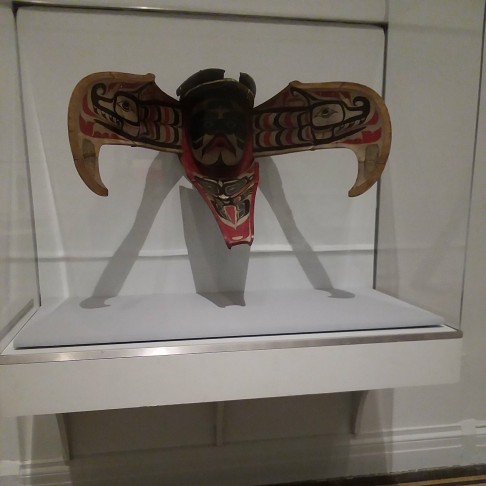 The mask would be danced during a Winter Ceremony, called a Potlatch, where songs, dances and rituals are performed and gifts may be given. 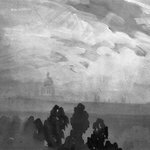 When not used such masks are wrapped carefully and hidden away. 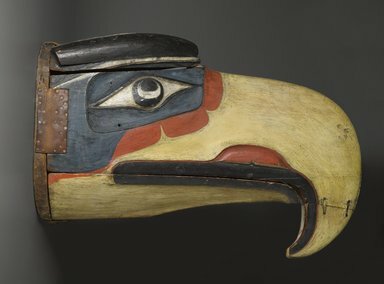 When worn and danced and closed the mask portrays a bird head with a large yellow beak. When open, the head and large beak divide, expand, and become a full-bodied bird with outstretched wings. 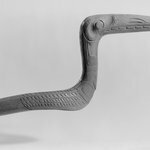 Each wing contains a linear image of a sisiutl or lightning snake. At the center of the full-bodied bird is a human head. 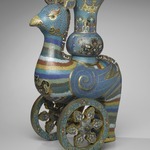 Above the head is a small seated figure and below it is still another bird. Opening and closing the mask would add a spectacular effect during the dances. When the mask was first collected it had cord riggings to open its parts. 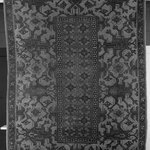 It was collected from the Gigilgam lineage of the Nimpkish. The mask is fragile but stable. 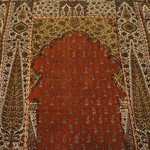 There are scattered pigment losses. 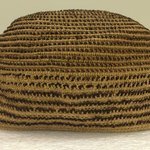 Red cedar ruff originally surrounded the mask when it was worn for performances.